Todd Friel wants you to question whether or not a person is really a Christian. 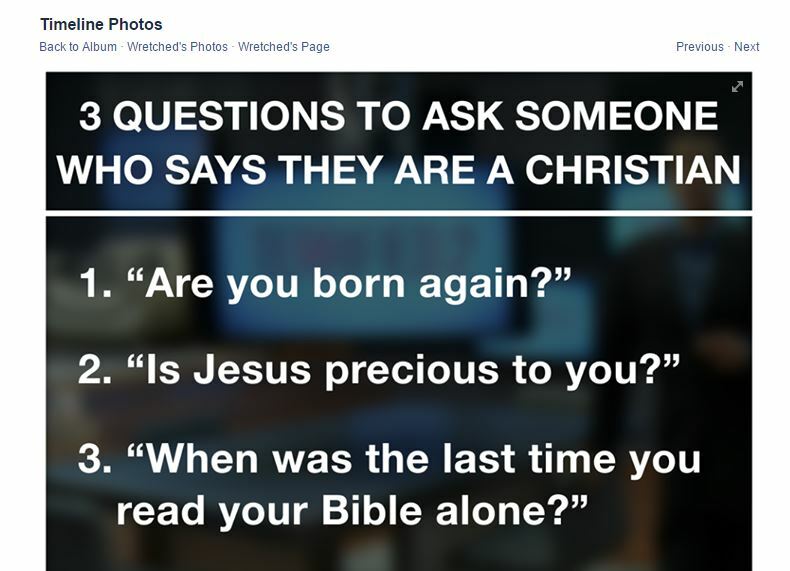 Julie Anne posted this picture on the SSB Facebook page and wonders, “Should we be testing people when they tell us they are Christians?” What do you think? As far as Kathi is concerned, I cannot get past the name “Wretched.” To me it suggests guilt and shame. I’ve watched a few of Friel’s videos and I get that impression from him as well. If you don’t have the right doctrine, you are wretched. Next postBiblical Parental Authority: Is Mom Equal with Dad on the Hierarchy Ladder or is Dad on the Highest Rung? I take a person at his word. If he says he is a Christian, that’s enough for me. I also hate the word ‘wretched’, which makes “Amazing Grace” a bit of a problem for me. It really slams the soul who is saved. If God loves us, how wretched can we be? I dunno, that’s just me. Honest question (from a non-Christian): Why would this question ever need to be asked? Isn’t it, simply in the asking, judgmental? It doesn’t seem to me to be a question of the “Do you like green beans?” variety, but rather, of the “How do you measure up… how do you compare… are you good enough?” variety. Seems to me that it’s a question asked from on-high that might immediately make someone defensive — and who should be put on the defensive about their own personal beliefs? Why is it ANYONE’S business to ask those three questions of anyone else? Ummm . . . the earliest Christians didn’t have a “Bible.” I guess we can count them out, right? The bible says ‘you will know them by their fruit.’ So yes, I believe we can question someone’s salvation. For instance, Driscoll’s sins over the course of years. What disturbs me is people like him get a pass but if you have a different doctrine than someone, such as Calvinism vs Arminism or women in leadership your salvation is taken into question. The problem is we are looking at the wrong things when it comes to determining one’s salvation. You can recite the bible forward and backwards, doesn’t mean you are a true believer. I don’t care how much bible someone knows. I want to know about your fruit. So if we will know them by their fruit, why the need to ask the questions? You don’t need to, I meant it more as thinking to yourself. Sorry I wasn’t clearer. In Friel’s world someone has to be the arbitrator of God’s truth. Those in his world don’t believe that God knows his own. Being the arbitrator of God’s truth also affords many men and women a means of income in today’s Christian world. If they answer anything wrong in the slightest, point-and-howl like in the remake of Invasion of the Body Snatchers then close for the kill. Beware Thou of the Mutant. Why is he asking these questions? Why do you have to read your Bible alone? What’s wrong with reading as a family? I don’t recall there being a set way of saying “I’m saved by the grace of God”. Being “born again”, if I recall, is only used once in the Bible. I have no problem being called a wretch. If it weren’t for Jesus, that is the state I would stay and the flesh can take over from time to time. Call me whatever you like, it won’t make it true. Even if one were to answer all the questions the way he would approve of would be totally meaningless. Me thinks this guy is so into himself and what he thinks that I might doubt his salvation. But I really don’t feel that declaring one to be saved or not saved is mine or anyone living on earth, position or ability. I agree with Gracie about fruits. But expecting good fruit from Christians is not popular these days. Good fruit is now a “work”. After all, there are many from Jim Jones to Mark Driscoll claiming they are Christians who would answer the questions correctly for Friel. I also agree with Carol asking why on earth these questions would be asked in the first place and of whom? This is a perfect example of those who live inside an evangelical bubble. Why did Paul ask the Ephesians if they received the Holy Spirit after they believed? (Acts 19) Rather a personal question and absolutely none of Paul’s business, some here might say. If evangelism matters to you, however, you have to get on the subject somehow. Perhaps there are better questions. What do you all propose? Out of love and concern for their eternal soul, I believe it is very appropriate to ask, “How do you know you are a Christian?” Then listen for the clues. That is a natural way to react, and it often opens up a conversation during which they may actually get saved! Many will say to Him, “Lord, Lord”… And He will answer, “I never knew you.” Those who don’t think they are saved wouldn’t say, “Lord, Lord.” Yet, they ARE damned. His questions are the topics that come up in conversation with my friends, but not the way he said them. We talk about what we’ve been reading, what the meaning of Bible phrases like “born again” mean, how great Jesus is, but we don’t boil it down to three pat questions. That’s just silly. Who asks those types of things of strangers anyway? The point of being with other people is to build relationship. What a person believes will become apparent as the relationship grows. If the person needs instruction on a point and the Holy Spirit equips me to help, great. That’s a blessing for me and the other person. But I don’t think I’m supposed to catechize off the bat everyone I meet who claims to be a fellow believer in Jesus. I think motive is the key. When someone says they are a Christian, I wouldn’t assume that they mean the same thing that I do but that, any more than I would assume that when they say the like barbeque they mean the same thing as I do. (We Southerners are all proud of our barbeque, but each region has a different idea on what makes barbeque good.) So a few questions, if asked in a spirit of curiosity and attempt to understand, seem fine to me. But if the intent is to judge whether a person measures up to the questioner’s idea of what a “real Christian” (TM) is, that would not be good. These particular questions do sounds like they could imply judgment of the validity of someone else’s faith claims. 1. Has God called you to sit on the Great White Throne of Judgment? 2. Do you have the Holy Spirit’s power to know the thoughts of others? 3. Have you sinned today? 2. What’s the music like there? 3. Want to go for coffee? I like Anon2’s response questions to Friel. I also like Shannon’s questions for a Christian and a great way to make a new friend. Well, if Friel’s intent is to provide a sure fire way to quickly and reliably determine someone’s salvation status via 3 questions, then I think what he has done here is to render discernment irrelevant. All we need are the correct answers to 3 pat questions and voila! We find a brother/sister (or not). Sometimes questions are helpful if, for some reason, the salvation status of a person is unclear. However, these might not be the right questions for the case. (And what about, “Who do you say that I am?” as a question? Jesus thought that was a good one and I’m thinking that one is more important than “when was the last time you read your Bible alone?”) But in general I don’t think it’s a good idea to replace Spirit led discernment with a list of pat questions. I can easily see a misdiagnosis in either direction via this method. I mean, which one of us knows the Scriptures as well as Satan? And oh yeah, the Pharisees knew their Scriptures so well they missed their own Messiah while searching those same Scriptures for eternal life, though those Scriptures testified of Him. Also, I would not use question 3 as a determinant of someone’s salvation status because they may have very good reason for not reading their Bible, such as it being used to abuse them in the past. I know I could not read one of Peter’s epistles for a full decade because a passage there was used against me wrongly and did me that much harm. Am I not a Christian then? Hardly. But what would Friel have to say if these questions were reliable? He would have to fight the Holy Spirit’s witness and say I was not because I did not meet his check list. As Tim said above, relationship is key here. And you cannot reduce relationship to 3 key questions. I don’t know why you would try. I’ve wondered this every time someone says, “I’m a Christian,” but then it’s revealed that they live with someone they aren’t married to, constantly gossip without shame, etc. As Gracie mentioned, you cannot discredit the importance of outward evidence of that claim. If someone called themselves a vegetarian, but ate meat only on Tuesdays, I would come to the conclusion they are not really a vegetarian. Except I’ve done the above behaviors, and more. I still call myself a Christian. I’ve done things I shouldn’t and felt guilty, realizing I am not measuring up. So realizing this about myself, do I have the right to critique someone because their “fruit” is flawed? We all have our struggles, and no one but the individual (and God, of course) knows where they are on the road of repentance. So like other comments said, if someone says they are Christian, I will take them at their word. I may have my doubts but it’s not my call to say if they’re genuine or not. Also worth mentioning: given the insane number of denominations out there, there are some groups that would say you can’t be Christian if you drink alcohol. There are groups that say it’s fine, so long as you don’t overdo it. And there’s Scripture to back up both those claims. So, bottom line: no one gets it 100% right, and only God can make the final judgment call. If I ask anything,it is “Do you believe in a Creator?” Or “Are you a believer?” From there the conversation can go in many directions. Look, I don’t always agree with Friel, but I respect him and have learned a lot from him. Regarding the use of the term “wretched”, I don’t at all think Todd thinks those with wrong doctrine are wretched. In fact, his slogan is that “he’s the guy that song was written for,” referring to Amazing Grace. Todd is saying that we aren’t God, and we are “wretched” sinners in need of God’s grace. I have no problem with that at all. To sum up, he’s essentially trying to get to the core issue of making a person think about whether they are truly saved are not. He is right in that there are many people who have “prayed the prayer” or whatnot and live a nominal Christianity and need to examine their hearts. But I do think his questioning can be a little bit intentionally aggravating, although I believe he is a sincere man. I think his personality in general is a little bit snarky and aggravating, which stems from his history as a stand up comedian, I guess. I have a couple of bigger beefs with Todd than this. Chiefly, look at his earlier post about “wrong answers” to the gospel, which he discounts people who “accepted Jesus into their heart” or “made a decision” or “said yes to Jesus”, presumably because those are nonbiblical terms. I think this a popular thing these days..taking pot shots at the sinner’s prayer. I do think there are some issues with modern day terminology as relating to salvation, but just because someone doesn’t understand theological terminology doesn’t mean they aren’t saved. God looks on the heart. Todd Friel looks on the language of one’s testimony and makes a judgment unfortunately. And I’ll say it again, Todd’s good buddy, who he partnered with for multiple theological resources through Wretched, RW Glenn, used all of the approved Todd Friel terminology, and it turns out he was having an affair for years. But not a word on that from Todd, the man who is normally criticizing people daily who aren’t in his camp. Also, as an aside, Friel really has gotten sucked into this whole courtship is a must bunk. The sooner he stops listening to Voddie Bauchum and Paul Washer on those things, the better off he’ll be. I personally believe his friendliness towards that theology has caused him to be a little too generous by failing to critique people that espouse that belief. Every day he is criticizing someone on his radio and television program, and quite a few people rightly. But not a dang word from him on Doug Phillips or Bill Gothard, and he would say that is because he doesn’t need to gossip. (I personally questioned him on this and that was his response to me.) But yet he has no problem dissing Driscoll, since he doesn’t like him. I guess that isn’t gossip or something. I find all of the above disturbing. Commercialized evangelism? blech. Me things Jesus would be turning over some tables. No prob – – that makes sense. Thanks! It kind of goes in line with his friends from Way of the Master who have the formula of questions they use. How does it start – – -“are you a good person?” I think that’s it. Exactly. But Tim, that’s called friendship evangelism and is a bad word with this crowd. That’s because you are decent human being with a heart and you demonstrate love and show it in action. These folks call it loving to ask pointed questions (shown above) and in fact, they will tell Christians if they don’t love people enough to ask these kinds of questions, then the love of God is not in them. I came from this environment. While my pastor and people from church would go out evangelizing in this fashion (Way of the Master – or asking similar questions to Friel’s), I’d watch people leave the church and have a crisis of faith, continually doubting their faith. Guess what the pastor’s response would be? “They never were of the faith to begin with.” I am so over this pompous spiritual arrogance in which humans appoint themselves to judge the hearts and soul of men. But if the intent is to judge whether a person measures up to the questioner’s idea of what a “real Christian” (TM) is, that would not be good. These particular questions do sounds like they could imply judgment of the validity of someone else’s faith claims. That’s what I think it is. You see, these guys have determined that they have the right doctrine and right belief system, thus, they are true Christians. They know that since they have studied this so much and have so much knowledge, surely most people haven’t attained their level of Christianhood, so they are looking for doctrinal holes in people with whom they interact. It’s all under the guise of, “I care for your soul.” Yea, right. The problem for Wretched for me is the focus on our sin. I know what excessive focus on your own sin can do to one’s spiritual life. To me, it also minimizes what Christ did on the cross. Shouldn’t we be focusing on what Christ has done for us? Who would ask a stranger these questions? Apparently a security guard I had never met before who was escorting me to my car after I taught an evening class at a secular college. He asked me if I was saved and I said yes. He then explained to me that while I thought I was saved I really was not because I had to be born again and that being brought up in a Christian church and continuing to go as an adult meant nothing. He became very frustrated with me because I wouldn’t agree with him that I wasn’t saved. I could have used the appropriate Christianese with him (I was Assembly of God) and reassured him but I was in no mood to do this. He was so proud of being a Christian ‘in the know’ among Christians who were going to hell because they had never responded to an altar call. He knew absolutely nothing about me and I can assure everyone that there was nothing in my appearance or behavior which should have caused him to wonder. Julie Ann, For me, I need a healthy balance. The realization that I was born into a sin filled world and that Jesus accomplished so much for me on the cross. I look to Him and ask forgiveness for sins that I may not realize I am committing each day. I ask that he point out things that need to be changed in me and to accomplish that work. Relationship with Him and realization of where I could be seem to go together for me. Marsha, I love being asked questions like that. It gives me the opportunity to give my testimony of the moment I repented and chose to accept Christ as my Savior. He was right about one thing, being in a church, no matter how long, doesn’t do the job, only Christ can. An alter call doesn’t do it either. Lots of people go to the alter. It doesn’t mean they got their heart right with God. This is a big reason that I don’t like tv evangelism. The sermon may be sincere, but people could be going to the alter afterwards for the wrong reasons and without a willing heart. This. I also know some who claim that only those baptized in Jesus’ name and who speak in tongues are saved. Everyone else is on the wide path to destruction. These same people cover up child sexual abuse for self preservation. Seems like a wise man once said that the world would know we were His disciples by our love one for another. Seeing that love is in such short supply these days . . . well, you have to wonder. Balance is fine, Brenda. I feel he needs to add the other side of Wretched – the side that gives hope. Julie Anne, Definitely. I wouldn’t listen to this man anymore than many of the other celebrity guys. So his version doesn’t count in my hearts thoughts. There is a song called “Child of the King”. “and I who was wretched and poor now can sing, Praise God, Praise God, I’m a child of the King.” There is a lot of hope in that song. I don’t know how to actually get it hooked in here. I did better than I thought I could!! Thanks for going over the points in my comment so thoroughly, JA. Right after I posted the thoughts in that comment I drafted a post that expands on them, bringing in Scripture that shows what Jesus said about who is in the kingdom and who is not. It’s scheduled for next Monday and links back to your post here. I know a man (an overseas missionary, actually) who asked a group of Christian teens, “How many of you love to read the Bible?” When the hands didn’t shoot up promptly, he told them they were all going to hell. So now I know where that came from (I already knew it wasn’t from the Bible). These folks call it loving to ask pointed questions (shown above) and in fact, they will tell Christians if they don’t love people enough to ask these kinds of questions, then the love of God is not in them. While my pastor and people from church would go out evangelizing in this fashion (Way of the Master – or asking similar questions to Friel’s), I’d watch people leave the church and have a crisis of faith, continually doubting their faith. There seems to be a theme of pigeon holing with these guys. First you have to answer these questions to their satisfaction because if you don’t, you may not be (or is it are not?) saved. Now, you have to go out and ask people these questions because if you don’t the love of God is not in you, thus showing you are not saved. I don’t see how it won’t end up with the whole thing really being about you and your salvation status. Which ipso facto makes the whole thing unloving because love seeks not its own. But how on earth do you avoid that with teaching like “you have to ask people pointed questions because if you don’t you’re not saved”? I mean, isn’t that the take home message? So now I’m wondering how much of their evangelizing is really them proving to themselves (and all their buddies who might think they aren’t saved if they don’t do this and teach others to do likewise) that they are really saved. I wonder if they are trapped in a web of their own making. Seriously. That’s what I think it is. You see, these guys have determined that they have the right doctrine and right belief system, thus, they are true Christians. Marsha – isn’t that terrible – I think your experience with the security guard sums it up -he didn’t respect you and he did not deserve a response, He was not mature enough in his faith to even realize his error in communicating with you so stiffly. This is the danger of this kind of teaching tool – it was all about him needing to tell you his new success formal to get to god. As if its a sales pitch and then you lose the power of humility and experience of being moved by the spirit. I am reminded of Romans 8:1 There is no condemnation in Christ – Condemnation is exactly what the questions are looking to other people. Marsha I am sorry that happened to you. “Wretched” means in an unhappy or unfortunate state. It is a British word–thus Amazing Grace uses it. Try listening to its use on Downton Abbey, for example, and you will see its denotation. The dog Isis was lost–she is thus a “wretched”dog. “They will know we are Christians by our love.” If you have to ask . . .
Christians are not the only people who show love. There are atheists who give more of there time, patience and love to others in need than some Christians that I know. I know some from India who have a variety of gods that are all about love. You could think they were Christians. Love and kindness to them makes you healthier and a better person, but it has nothing to do with the Love of Jesus, which is the only love that matters. If someone strikes up a conversation with me and I show them that I really don’t want to be bothered right now, that won’t show them the love of Christ. I need to always seek guidance from the Holy Spirit even if I am not in the mood. Showing love could also mean not enabling. Love sometimes has to be tough. True. My point was that those who are asking these questions are not, in my opinion, demonstrating “love” – because the questions in and of themselves are judgmental and, in my experience, abusive – causing some people to question their relationship with God/Jesus. If THEY are the magnanimous Christians they claim to be, they would be loving people – not leading them into condemnation by their burdensome questions. Oh, and I didn’t say that others aren’t able to love, either. But, if people see your love, they just might consider the possibility that you are a Christian. But then, I don’t encounter all that many “loving” Christians, so that’s probably not going to work. How sad. In that case–agreed. No one has to cause me to question. I have questions from time to time. Am I a good steward of my time, money, talent? The big names that ask ignorant questions: I want to know who they are so I know to stay clear of them. You get more from honey than vinegar. There is a church in the city where I live who go door to door every Saturday, which is not my thing. One Saturday a couple of young teenage boys came and asked if I were to die that day would I know where I would go. I responded, yes. They then asked me how I knew. I gave my testimony and they still left a tract. They were being trained this way. I could understand how the boys responded, but not the adults who sent them. You don’t send a newbie Christian to have a conversation like that without someone who knows how to approach this topic. Personally, I think going up to a total stranger can be a turn off for them. But then again, while coming home from FL a few weeks ago my daughter (who is not a believer) and I were at a gas station. A woman pulled into the station just to witness to my daughter who was pumping the gas and gave her a tract. I had been praying that someone would come that my child would listen to and show her Christ’s love and the gospel. That person is not me. I continue to pray for these miracles that would lead her to Christ. If it takes total strangers, I’m all for it. You’re right, that is sad and I have found that to be true as well. Churches tend to be made up of small clicks and getting into one or more is very hard. I would rather talk to people who I’ve never seen before. Marsha – I find that behavior so odd. And I’m sitting here shaking my head thinking about how this is the behavior my former pastor used with complete strangers. I see it mostly within the Reformed groups, too. I just don’t get it because their doctrine is about election. Or, put differently, we will have a tough time coming up with a universally recognized sign that another person is a brother or sister in Christ. Closest thing I can come up with probably doesn’t work anymore; when Roman believers in the persecution met each other and suspected that link, they’d make the sign of the fish. “Ichthys”: both a creed in code (acronym for “Jesus Christ, God’s Son, Savior”) and a great way to get yourself killed if you met a hostile unbeliever who knew that code. Faith showing itself in some bravery. Best way I know now of figuring out whether someone is a believer or not these days is to simply let them talk. They’ll let you know whether their salvation is by faith in Christ or not soon enough. 1. Are you born again? Culturally this question won’t make sense to so many people and my response would be, what do you mean by that? 2. Is Jesus precious to you? Deep in my soul I know this is true but after going through a lot of abuse I really am spending a lot of time mad at God/Jesus and I don’t read my Bible, it’s too painful right now. But I have hope. I am sure deep down in my soul that I will go to heaven and I am saved by grace. God’s grace can cover my anger even if I spend the rest of my life in anger. Having a list of 3 questions is honestly a waste. Jesus’ mission was meeting ppl where they were meaning have conversation. Not a list of 3 q’s. Ask questions like what does that mean to you. Tell me more about what you believe. And just talk. The best conversations come when you aren’t going in to it with an agenda but with a heart of care and compassion and just to enjoy another person like Jesus does. The best conversations come when you aren’t going in to it with an agenda but with a heart of care and compassion and just to enjoy another person like Jesus does. Welcome, cboetcker, what a great response. I think there are a lot here who could echo your sentiments about having difficulty reading the Bible and being angry. This is SO ridiculous. I really have no patience for those who add other conditions besides belief in the life, death and resurrection of Christ. Is Jesus PRECIOUS to me?? Good grief!!!!! MORE than precious!!! Why is that SECOND??? Jesus is first and last, and everything in the middle. The Bible? It’s the way we get to know Jesus. The Bible is NOT God – Jesus is. Lisa, that’s my problem too. I can’t get past the fact that folks are trying to add to faith, & adding all kinds of their own ideas of what they think a Christian is like. “For My yoke is easy and My burden is light.”……..Then Jesus went through the grain fields on the Sabbath and His disciples were hungry, and began to pluck heads of grain for to eat. After another intense harvest, body aching from head to toe, and mind numb from intense mental stress (always have to be alert and thinking so as not to be another farm accident statistic—last year, I thought I was going to meet Jesus while driving semi as it became dismembered on the highway, also, several years ago, due to fatigue and not thinking, caught myself leaning over an auger while unloading corn, with my hood strings dangling inches over the auger reels—a deadly accident in the making) ……I drove to the nearest wildlife area for “church” with our LORD. It is a quiet place, there off the beaten path, down by the dammed up lake, where missionaries of yester-year built a fort/mission to share the Gospel with the natives in the late 1800’s. 1. does not Jesus say we are to come to Him? 2. even when we labor and are bearing the weight of this world, are we not to come to and abide in Jesus? 3. are we not to learn from the Master Himself, our LORD and Savior, Jesus, the Christ? 4. is not Jesus gentle and lowly in heart that we, the insignificant of this world, can humbly approach Him at the cross, through His Words to us? Or do we have to have a theological degree complete with some form of leadership status in order to rightly divide the Word? Is there more than God, the Holy Spirit, speaking and teaching us? 5. and who do we really find rest for our souls in? In ourselves? In our great works? In the pride of this life, or the boasting and bragging of what we have done? (And yes, I am guilty as charged for these competitive humanistic aspects myself and so in need of repentance at times.) Where the Holy Spirit convicts, there is need of humbling thyself before Him in His presence….in being broken over our own sin. God’s Word is so much greater than man could ever afford. Praise His Holy Name above all Names. I have had the opportunity to see and hear Mr. Friel give a clear, concise Gospel Message, at one of the surrounding state fairs our family attends. He was rock solid in his speech, so as one of the listening passer-byes, I will give him the benefit of the doubt in asking these questions listed above. I do not and will not believe they were meant for harm, regardless of their presentation, for the final judgment belongs to our LORD alone. Having come out of a very abusive church organization where the individual’s salvation is questioned each and every Sunday by the pastor and his leadership team in lording over the assembly (who incidentally do not have their own houses in order), I now run to the Word of God instead of men for wisdom. I find the Comforter, and Hope, and the Living Water there…..all of which are Jesus Himself. I am in agreement with Brenda R. and all of those who believe that we do need to examine ourselves first, and then discern what others are saying in the Name of God to the rest of us. I too, have been hoodwinked, snookered, and bamboozled, by charlatans who claim a jesus of their own making……i.e…..I was told that in order to really know and follow god (another god here), that I must not each pork (swine/pigs), for Israel in the Old Testament was commanded not to eat such an animal. And by the reasoning that “God has not changed”, we are to continue in the same law mode of not eating pork…..so this individual is earning their salvation by picking the pepperoni off of her pizzas…..not exaggerating here. Do I feel the need to ask others if they are Christian? No, I personally do not engage with these lines of questions, however, I do love visiting about our faith in Jesus Christ, and His Name easily rolls off of the tongue of those who really love and trust in Him alone for their salvation. Just try talking about Jesus and the wonders of what you are learning in His Word……then watch as most of the church attendees squirm and become uncomfortable because you are speaking of what you have learned. Squirming, rolling the eyeballs, quickly shutting your speech down, changing the subject quickly, excusing oneself rather abruptly, asking for prayer in the Name of Jesus…..there may be other “signs” here…..all speak loudly of what is truly in the heart of the other party. Many want church, but they do not want Jesus and His teachings. And so a sinner I am, a wretched one at that, desperately in need of Christ as my Savior each and every moment of every day. For the Cross is free to the one that believes. Sorry Julie Anne, if these comments get alittle too long for your ministry here. Please erase if necessary as there will be no offense taken here. Thank-you. God be with you and yours this weekend. That was a beautifully written testimony. You have truly been blessed with not only God’s saving power, but his provision of safety and a beautiful place for “church” and communion with Him. This is a wonderful message and so glad you wrote it. It touched my heart. Because if you can pressure him into breaking down and doubting (like in the infinite-regression tactic of the Ressegue Regression), once he is broken you can take out YOUR Bible and Four Spiritual Laws/Romans Road and put another notch in YOUR Bible for bragging rights at the Bema. Back in the Seventies, I got to be a notch on half a dozen Bibles that way. Then I became a proto-None; after the first few times you start wondering if it’s all BS from Day One. As you already know in your heart, you, a friend of Jesus, the Glory belongs to Him alone, and this is the thanksgiving we cling too. Also, there is thankfulness in my heart for the abusive church that I came out of, for many of the issues that Julie Anne poses here, have been experienced by many, and this is a blessing to us as we share and bare one another’s burdens. In my former church, it was only “the important people” that garnered sympathy, compassion, and a tongue at the table for all to listen too with regards of which side to take. The rest of us were useful idiots to be used as ends to their means. So I do struggle in trusting pastors and so called leadership, who desire the places of importance and the worship of man, rather than humbling oneself in prayer and supplication for ALL who are hurting, suffering, and in need, not just the power elite. Your encouragement has blessed my faith in Christ alone. I believe this is called “edification.” May God richly bless you, Brenda R.
Just saw this, haven’t watched the video, just the three questions are very LEGALISTIC and RELIGIOUS. It’s like, if you don’t answer the way he wants then are you going to argue? More shame, guilt, condemnation and criticism. It’s like the #1 one question now in public if they find out your Christian, is where you stand on homosexual issue. We’re you for proposition 8 (in California)? Beyond that, much is made in these threads of abusive leadership, and that is, unfortunately, a very real and significant problem. One of the weapons to fight that battle could be a measure of discernment in selecting leaders to begin with. After all, the wolves do not parade as wolves. They are dressed as sheep. Paul says Satans messengers are clothed in light, pretending to be apostles. Is it not to be expected that if wolves become shepherds they will start eating sheep at some point? And if that’s the case, is it unloving to, for the sake of the flock, have some sort of diagnostic in place to detect false sheep? Isn’t Todd’s point simply a recognition that false believers exist, and potentially a danger (take someone who is unsaved and has no influence of the Spirit and if Eph 2:1-3 means anything is not living for the benefit of others) we do well to use our minds to try to make at least a rudimentary evaluation? There’s not a pile of doctrinal baggage in the questions, as I see them. They are asking basically if a person genuinely loves Jesus when nobody else is watching. The assumption is that wolves don’t wear their sheepskin in their own homes. All of us have been, I suppose, either harmed, disappointed, or an awful combination of both by people who call themselves Christians but are stained by sheep’s blood, and we think, “why didn’t I see that before?” Maybe an option nice of prevention is worth a pound of cure. Will we be called judgmental and unloving? Yes. But is that really the case? Not necessarily! Joe, great comment. However in your verses, look at the pronouns. Who is supposed to examine us? Self-examination is certainly the place to begin! Though the pronouns are in fact plural, suggesting a corporate aspect. Jesus said repeatedly in Matt 7:16 and 20 “you will know them” followed up by an account of people who arrive in heaven thinking they were Christians but in fact weren’t. I can’t imagine the horror of being surprised to be tossed out of heaven, but that’s in fact what appears to be happening. So when is the time to make certain of ones salvation, then or now? And is it in fact hateful or helpful to others to help them question their own salvations reality? I would say it depends! It depends on the given definition of the gospel, the motivation, and so forth. It’s a bit sticky for sure! Paul says Satan’s messengers are clothed in light, pretending to be apostles. Is it not to be expected that if wolves become shepherds they will start eating sheep at some point? And if that’s the case, is it unloving to, for the sake of the flock, have some sort of diagnostic in place to detect false sheep? Sure, but why should Friel’s questions be especially reliable as a diagnostic? If a wolf is intentionally dressing up as a Christian leader, why would he answer these questions honestly? If his deception is going to be successful at all, he should know the pat answers already. What’s to keep him from just smiling and saying whatever sounds right? You are correct, a sinister person could, and probably would lie in answer to these questions. And they’re not diagnostic questions I’d die for. How do I know that won’t happen to me? Because I “feel” saved? Proverbs 28:26 says “he who trusts his own heart is a fool.” Jeremiah 17:9 says the heart is deceitful. There really will be people who go to hell thinking they were going to heaven. That’s disturbing! What if that’s me? How do I know I’m not going to be one that says I know Jesus but Jesus says to me “depart from Me I never knew you”? Well, you “know” by fruit. The fruit of genuine salvation is, among other things (Gal 5:22 would be a more comprehensive and satisfactory list no doubt) having been “born again,” considering Jesus to be precious (many Christians seem more interested in the religion and the benefits than the Person) and who has a hunger for the Word. That being said, asking if someone subscribes to the 5 points of Calvin (or rejects them!) as evidence of salvation would be clearly improper and potentially sinister. But basic questions like this can be helpful. We expect doctors to ask us questions, even when we go in for a checkup feeling “fine.” It’s ok to feel “fine” about the condition of your soul and still be questioned. The problem I have with Friel’s approach is that he does this with pure strangers. Friel used to work with Way of the Master and they do not like friendship evangelism at all, but they think they can ask such personal questions to a stranger. Now think about it, spirituality is personal. Imagine asking someone blunt questions about their physical health, “Do you have hemorrhoids?” If you think about it, Friel is asking the person if they have spiritual hemorrhoids/flaws. To talk to someone asking about their physical flaws is rude and I say it’s equally rude to do the same spiritually if there is no relationship established. But Friel and those like him don’t care about being courteous, sensitive, kind in the way most people understand and practice it. They believe 100% that they ARE being courteous, sensitive, and kind because they are caring for their soul. To that I say, if they are caring for their souls and scare people away, they may have done damage to their souls. Now . . .on the other hand, if you have an established relationship with someone and you bring up spiritual topics, I don’t have a problem with that. Now here’s another thought: Friel, Miano, my former pastor, etc, are quick to call pure strangers out using this test or others like it. Do they also give this test (or similar) to their friends? Also, when their friends become spiritually abusive, do they care enough about the spiritual souls of those influenced by the spiritual bullies to call their friends out? I think you’ve landed on the “tricky” and “delicate” nature of the matter at hand. It could be done in a caring way, and it could be done arrogantly and rudely. I think these questions could be helpful. But they could, in the wrong hands, be abusive. The question about calling out abusive friends is a good one, and I would say a good indicator of how “good” a friend is. A friend’s wounds, Proverbs says, are faithful wounds. Some of the popular and powerful (speaking of influential power) men of the day need some more “faithfully wounding” friends! I think I came to those strong opinions by observing those who hold to the position they have a right and responsibility – actually some would observe it as an entitlement (in abuser language), to ask the questions. I’ve noticed the pattern that those who get angry about friendship evangelism and loudly shove the Gospel and any spiritual-related question in strangers’ faces are also the same ones who remain silent when their friends act like spiritual bullies. It’s important to note these patterns. Here’s a theological issue, I guess. Of course there are people that pretend to love God and don’t, people out to scam believers, wolves after the sheep. But how is it possible for someone to be sorry for his sins, love God, acknowledge Jesus, and seek to follow Him and NOT be saved? If Todd Friel spent as much time trying to win sinners to Christ as he does trying to convince confessing Christians they really aren’t Christians, his time would be better invested.